Bob List stood up to organized crime. "One of the things I had done as Attorney General is, I started going after the mob in Las Vegas. "We didn't have a lot of evidence but everybody suspected it," the Governor recalled of his 1978 race for the Nevada Governor's house. "We were in the farming business, grapes and oranges. My father always wanted to get into the cattle business and he bought a ranch in Elko in 1949 and we began to spend a lot of time up there. He bought another place between Reno and Carson City in 1951 and we moved there and that's when we left California. In those days there were only four paved streets. I would have been 14, just going into my sophomore year in high school and I very quickly became aware of state government. We had a guest house on the ranch and rented it out to a legislator from Elko." As a young man he became acutely aware that he would never be a rancher. "I was allergic to horses, all kinds of hay, that was just not meant to be. But I was interested in politics at a very young age. I was immersed in it but it became immediately clear what an interesting career it could be. It was democracy in action, right before your eyes you could see laws being made." "My Dad was a pilot, he flew (then Governor) Charlie Russell all over the state. I went up to Utah State to go to college and I majored in forestry and finally I took a class in Political science. Professor Jud Harmon who was just an amazing guy, taught constitutional law and I decided then that I wanted to go to law school." After graduating from Hastings Law School he moved home, to Nevada's capital city, to set up his practice. "A year or two later I was doing some work for the DA on a contract basis. I decided that I enjoyed criminal law and when I thought about becoming a DA I thought I'd like that and I was attracted to being in a political office. Toward the tail end of college, before I went to law school, I was beginning to think, 'wouldn't it be something if I could someday run for governor?' I didn't tell anyone for a long time." In 1966 he decided to make his first run for public office. He targeted the office of District Attorney because, he said, he could envision a better functioning office for the people's attorney. "I hired a guy named Pete Kelly to advise me. He had a PR firm in Carson City and he put together a little piece of literature for me. It was red, white and blue. 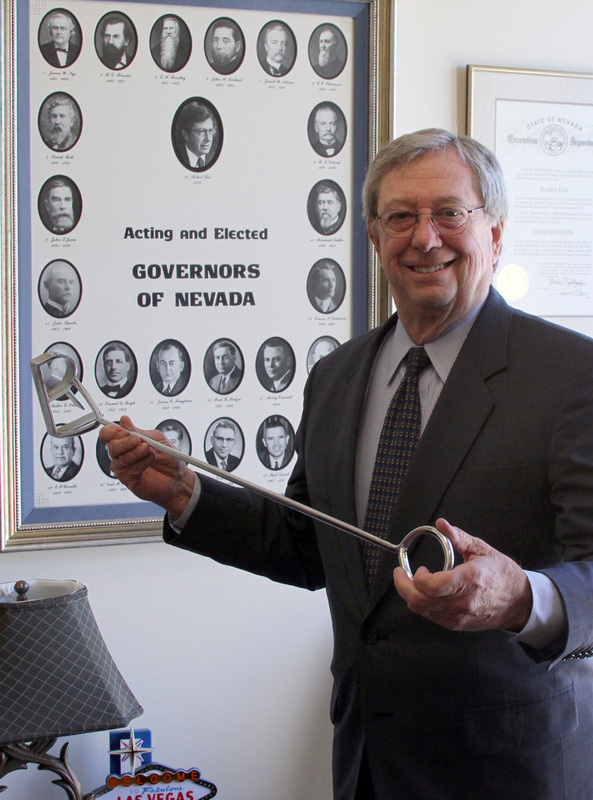 He created a brand which was RL and it was on a branding iron and the theme was 'Nevada's Brand of Action'"
While acting as Carson City's DA he became president of the state chapter of Young Republicans, connecting himself with the party statewide. In private practice he worked alongside Paul Laxalt who was elected to the governor's office that year. As a volunteer for Laxalt's campaign, and running his own, first hand, List got a double-dose of experience. "Finally I got involved in the Young Republicans National Federation and I was invited to go to Vietnam. So I made that trip in 1966 and that was my first taste of international politics and so we used some of that in the campaign. It probably didn't have anything to do with being a DA but it showed I had broad experience. I ran against the full-time Deputy DA and I took it upon myself to literally knock on every single door in Carson County. I walked and walked and walked." By then the would-be governor had set his sights higher - he targeted the office of Nevada Attorney General and in 1968 he served as the point man in an attempt to amend the state constitution. "I spoke to every Rotary, Kiwanis, Chamber of Commerce, every city and every county and I made a lot of friends and decided then that I could run a statewide campaign." With branding iron in hand he took-on three-time incumbent Harvey Dickerson. "We did television commercials like the old Bonanza television show. It was a good campaign and I wasn't given much of a chance of winning. Dickerson was a big name - he was seen as invulnerable. But I could see what a lousy job was being done. I did a lot research on AG offices around the country. Jimmy the Greek, he put my odds at winning at something like 65 to one." A pilot, like his father, List barnstormed the state. "I had my saddle in the back and I'd go to all the parades," he recalled. A client led him to a celebrity and Nevada ranch owner Art Linkletter who agreed tape a television ad for List. "We wrote the script, something, like, 'hi I'm Art Linkletter and I'm a Nevada Rancher and I care about Nevada and I'd like my friend Bob List to get elected.' We ran it on daytime TV. It cost, I think 15 dollars a spot and ran in the middle of all the soap operas. We ran it on radio and on television. By the first of October polls showed List in the lead. By November he became the first Republican elected to the office of Nevada Attorney General since 1894. "We established a criminal division, we opened an office in Las Vegas. We established an anti-trust unit." During his two terms as Attorney General, he served beside Democratic Governor Michael Callahan. "I remember sitting down with him shortly after the election. I said, 'here's what I feel is my role. I'm going to be the lawyer for state government and you're the head of state government, so you're my client. Our discussions will be privileged, confidential. I won't try to upstage you, I will serve you and I will serve the state government.' And basically what happened is Callahan played a hands-off role in my run for the governor's office. He and I were very close and he never did anything to endorse my opponent, Bob Rose. That made a big difference. If he had come out and campaigned against me, he was a very popular guy, that would have been very tough to overcome." After two statewide campaigns List was well prepared for the run. "By then I knew all the ins and outs of state government. I knew every Department Head of every agency and as AG I continued to build my relationships all over the state of Nevada. I probably should have delegated more. I was doing most it myself. I raised the money myself and because of my experience, I already had a campaign manager in each county - someone I trusted who would be responsible for organizing that county." A lot of the money in those days came from the gaming industry and there were no limits as to how much individuals or corporations could donate. "And it didn't have to be reported. So it was relatively easy to raise significant amounts of money. We stressed my experience and my competence as AG and when I was in Elko we'd talk about the livestock industry and when in Las Vegas you'd talk about tourism." Having stood up to organized crime as the Nevada Attorney General gave him a reputation of being his own man and of having the courage to do what was right for the public good. "One of the things I had done as AG is I started going after the mob in Las Vegas and the common belief was, they came to Nevada because here gaming was legal and they could operate and do things out in the open. We had a guy by the name of Lefty Rosenthal at the Stardust Motel and it became clear, he was not licensed. He had a felony record and we made a decision to call him forward to apply for a license. We denied him a license and he took it to the State Supreme Court and I won that case and then he took it to the US Supreme Court and won it there. So we had a lot to talk about, being tough on crime, not afraid of the mob." His opponent, Rose, had been Callahan's Lieutenant Governor. "I think we led from the beginning. I had a lot more name ID than he did. List said he fared well in the debates and that both sides ran a fairly clean campaign. "Our wives were involved in the campaigns. My wife put together a cookbook - the Kathy List Cook Book. It was full of pictures of the family, my children, my wife. We had this thing printed up we went through three or four printings. Everybody wanted one. Those things were a big part of the campaign. It was terrific and each of my kids put a recipe in there, it was down-home stuff." "Depends on who they are and how they're motivated. I would never encourage someone I don't trust. The right motivation is to do good, to make a change for the good, to put positive policies in place. "Sometimes you just see the ego all over the guy's face or the woman's face. Sometimes you see someone that's modest, but you know they're bright and you can see charisma. I would never encourage anybody who I didn't think could win. If they have no history of accomplishment, or if they are someone who couldn't raise money. In my mind you've got to look and act like a winner and talk like a winner, have goals and ideas that make sense. I also caution them about what it does to your family and your life. It's very damaging to your family," the Governor said.